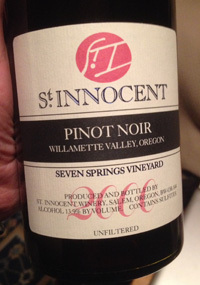 2000 St. Innocent, Pinot Noir, Seven Springs Vineyard, Willamette Valley, Oregon. Mark Vlossak has been making great Oregon Pinot since the late Eighties with his St. Innocent Winery, based in Salem in the Willamette Valley, remarkably he and his wines still fly under the radar and they are some of the best values in Pinot Noir in the world, bar none. Recently, a winemaker friend pulled a bottle from his own cellar and handed it off to me, and which I shared with my mum, this bottle was absolutely brilliant, glorious and mind-blowing with texture, grace and depth, it is hard to imagine a wine being better or more pleasing at nearly 14 years old and from a vintage no one really rated highly, this is special stuff, no question. St. Innocent makes up to 6 different vineyard select wines each vintage, I’m always a fan of Shea and Temperance Hill, but all are superb wines with Zenith, Momtazi, Freedom Hill and Justice Vineyard being the other current Cru wines here. Sadly, after the take over by Evening Land, Mark was not able to get Seven Springs Vineyard one of Oregon’s true Grand Cru sites, making these older Seven Springs wines that much more exotic and rare. This vineyard is set in Eola-Amity Hills on a perfect palate of soils and with just the right exposure, with a volcanic mix known as Jory and old vines mostly own rooted Pommard clone it provided Mark in 2000 glorious fruit and the wine is showing fantastic now in 2014. The 2000 St. Innocent Seven Springs is still youthful in the glass with a dark ruby hue, no signs of age in the color and a fresh grapey dynamic on the palate with a cascade of red and black fruits including plum, currant, black cherry and brambly mountain berry along with notes of chanterelle, oyster shell, flinty mineral and anise with hints of cedar, saline and faint char that is like a ghost of oak shading. The tannin is silky having melded in perfectly over the years and the acidity is lifting still and provides a juicy framework, this is beautiful and elegant Pinot Noir that is majestic from start to finish, drink now and over the next 3 to 5 years, it is sublime. Note to self, get some St. Innocent 2012 to put away! 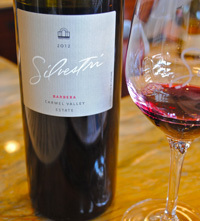 2012 Silvestri, Barbera, Carmel Valley. Alan Silvestri, famous award winning composer who has scored many movies and recently was nominated for another Emmy for his music in Cosmos, owns this small estate deep in Carmel Valley. I remember when he started out there and it was great to catch up on his wines, which are all estate offerings now, with Syrah his main love, but I discovered the Silvestri Barbera this time around, it is the first release for this varietal, and it is absolutely delicious. The 2012 Estate Barbera is lush, vibrant and succulent with a dark ruby, blue hue in the glass leading to a stylish and fruity palate, and while not very similar to it’s Piedmont cuisine, it shows very nice open fruit with black raspberry, loganberry, raspberry and plum along with zesty acidity and sweet herbs and chalky stones. There is very subtle wood/cedar notes and a hint of licorice and a lingering strawberry essence on the finish, this is a fine inaugural effort with this Italian grape, drink over the new few years, best from 2014 to 2017, this was fun stuff, available at the Silvestri tasting room in Carmel by the Sea. 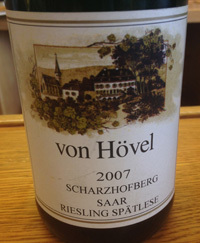 2007 Weingut von Hovel, Riesling, Spatlese “Scharzhofberg” Saar (Mosel) Germany. From the Saar area near the Mosel, von Hovel is one of Germany’s most acclaimed estates, owned by Eberhard von Kunow a sixth generation winegrower, located in Oberemmeler, Konz. The reins of winemaking is now in the hands of Maximilian von Kunow and he has a great palate of historic vines to craft his wines, this estate has been around since Monks constructed the cellar in the 12th century on the Saar River near the confluence of the Mosel. The famed Scharzhofberg is a site that produces denser and fuller flavored Riesling making a top site for Kabinett and especially good for Spatlese with heavy soils of weathered slate on a stony hillside. The 2007 von Hovel is rich and deep highlighting the richness of this near perfect vintage in the Saar and Mosel region, but as always the von Hovel shows finesse and balance, all ready showing fine detail and serious concentration, this wine has ages of life ahead. Starting with honeyed peach, candied pineapple, quince, apple and apricot the 2007 Scharzhofberg by von Hovel has a forceful palate and lavish feel, plus there is loads of mineral and stony notes with hints of earth, golden figs, brine, key lime and kiwi. A lingering white tea and tropical essence add to the pleasures delivered in this stunning, golden hued Riesling, this is an impressive showing and I would have a very hard time to keep my hands of this gorgeous Riesling that shows a deft focus and class, hiding the overt sweetness, while being a lavish and hedonistic. Drink this wine over the next 10 to 12 years, and be sure to check out young and old vintages of von Hovel, these are lovely examples of pure terroir driven Rieslings. 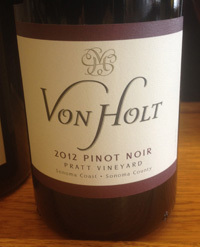 2012 Von Holt, Pinot Noir, Platt Vineyard, Sonoma Coast. San Francisco’s Von Holt, owned by ex secret service agent Chris Von Holt, is a label that has been raising it’s game and sourcing from top vineyards, and these 2012 wines are a major step up for them and winemaker John Fonnes, a serious talent here in the City. The new Platt Pinot is sublime, elegant and shows a wonderful delicacy with fine details and a silky palate, as you’d expect from this site in the cool Sonoma Coast, a site that Littorai and other great wineries favor. Fonnes tapped into the inner core of purity with this beautiful Pinot Noir, there is dream like quality to this wine that really appeals, this is very seductive juice and it is remarkably refined and has nice lift and cut with vibrant, yet smooth acidity and no noticeable alcohol heat, everything is gloriously seamless. The Platt starts with rose petals/water, tea spice, wild strawberry, fresh picked plum and a core of cherry fruit along with a hint of smoke, fennel, light cedar and salted gravel, finishing with framboise and a faint trace of vanilla, showing a deft touch with the wood. This wine is medium weight, classy and focused, while it may not be a blockbuster or a wine to age a decade, it is really good now and should prove a worthy find over the next 3 to 5 years, drink 2014 to 2018. 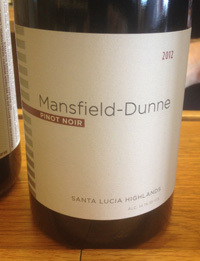 2012 Mansfield-Dunne, Pinot Noir, Santa Lucia Highlands. This new label from the Santa Lucia Highlands, Mansfield-Dunne, is making some very good Pinot, crafted by Ed Kurtzman the former Roar winemaker and partner in August-West, and this new 2012 is a fine effort. Ed has lots of experience with the Highlands fruit and it shows in this rich and compelling wine, this is one of the best of many new wineries to release from this region, it shows good density, balance and terroir character. While many 2012 wines either show almost over ripe fruit or high tannins, this does not, Kurtzman got the focus and drive to make a super Pinot, but with plenty of lavish dark fruit you’d expect from this area and is very close in style to the Roar wines he made in the past and it is drinking very well right now. The 2012 Mansfield-Dunne shows red raspberry, cherry, loganberry, plum and sugar beet along with loam, spice, briar, dusty stones, saline and licorice. The texture is lush and silky and feels polished and creamy, and the toasty, smoky oak folds well into the wine with a subtle vanilla note. There is a lot to admire here and I look forward to seeing where this wine goes over the next couple of years and I will keep an eye on future releases, drink this from 2015 to 2018. 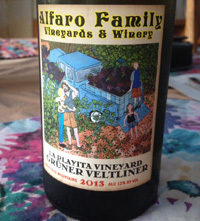 2013 Alfaro Family Vineyards, Gruner Veltliner, La Playita Vineyard, Santa Cruz Mountains. Richard Alfaro’s latest Gruner is a electric/zingy and super crisp white that will appeal to acid freaks, it is a fantastic example of varietal and it shows bright flavors and is very refreshing. The La Playita Gruner is all from certified organic vines on the Alfaro estate and it gives a clear view into the grape’s potential, and in fact Richard Alfaro is so pleased with the results he has grafted over another plot of Gruner Veltliner, plus this success has given him the push to plant more white varietals, he will have a small crop of Grenache Blanc and Albarino very soon. The Gruner is very exciting with lots of character, it blitzes the palate with zesty lemon/lime, white peach, green apple skin, loamy saline, white pepper, verbena and almond oil. This pale/greenish hued dry white, 12% alcohol, is light to medium in body with great life, vigor and intensity, making a good case for this Austrian grape in the state, especially here in the cool Santa Cruz Mountains, very near the Pacific Ocean, drink this interesting expression over the next year or so, and be sure to search out these cool new offerings from Alfaro Family Vineyards. 2012 Egon Muller, Riesling, Scharzhof, Mosel Germany. Undoubtably Egon Muller makes great wines and his are wines that collectors flock to, especially in a vintage such as 2012, but that said they are wildly expensive for what you find in the glass, even this delightful QbA seems a bit pricy. This is not a knock to Egon Muller as much as it is that my expectations were really high and that there are so many fantastic German Rieslings available now, and this wine did not live up to my hopes at this stage, even though it is really nice and was a super wine on the evening giving good refreshing relief to a hot day and warm night. 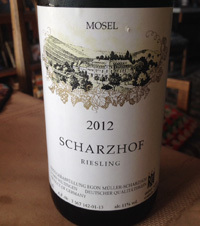 With a slightly sweet palate and crisp acidity, a good match for some spicy Chinese food, this is a fine effort showing lots of mineral, white peach and juicy citrus, the Scharzhof is very pleasing and pure. I may be a little tough on this at this point, as it should develop nicely over the next decade as the vintage is one of the best in a generation. Classy details emerge with air and subtle earth, tropical essence, lime and briny notes add interest with a finishing touch of lemon, melon, stones and basil. A lingering honeyed mouth feel and tangerine make you want to pour another glass, drink over the coming 5 to 10 years, maybe best between 2016 and 2024, as I imagine there is much more to come here, in other words WAIT and be patient. 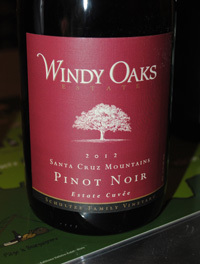 2012 Windy Oaks, Pinot Noir, Estate Cuvee, Schultze Family Vineyard, Santa Cruz Mountains. The Schultze family have opened a new tasting room in downtown Carmel by the Sea and it was a good rest stop offering a quiet space to enjoy their quality set of wines. While I really like visiting their vineyard site much better, this new tasting room is cozy and hopefully will attract a wine seeking crowd once they get established in town. It is amazing to see Carmel embracing so many tasting rooms, which have suddenly popped up like t-shirt shops did in the 90’s. It will certainly take teamwork to get the Carmel network of tasting rooms running smoothly, but the addition of Windy Oaks is a huge plus, and I hope people get in to taste their Pinot Noirs especially, as they are very lovely wines. I tasted through the 2012 Pinots and all offer distinction and take full advantage of near perfect vintage with ripe fruit and smooth tannins and juicy acidity, these are a quite a bit more rich than 2011, but still have cool climate character and you can still feel the closeness of the sea. The 2012 Estate Cuvee shows tangy raspberry, cherry, rose water and strawberry in lush layer with underlying zest, spice and earth tones along with soft cedar, vanilla, mineral and saline, like salted cranberry adds zing to this silky Pinot. Drink over the next few years, and be sure to visit the new Windy Oaks Estate tasting room on Dolores near 6th in Carmel. 2012 Alfaro Family Vineyards, Pinot Noir, Trout Gulch Vineyards, Santa Cruz Mountains. Richard Alfaro makes a great lineup of estate and single vineyard wines, his Pinot Noir lineup includes his estate, the Lindsay Paige Vineyard, Lester Family Deer Park, the Garys’ Vineyard from the famed vineyard cur in the Santa Lucia Highlands, the Schultze Family Vineyard from Windy Oaks Estate just down the way from the Alfaro estate, and this gorgeous Trout Gulch Vineyard Pinot, a vineyard Alfaro started working with a few years back and a site that is getting a lot of attention with it’s old vine Pommard and Martini clone Pinot Noir on a mostly south facing slope above Aptos in the south Santa Cruz Mountains. Only 500 cases were made of this opulent and richly favored wine, it saw 12 months in French oak barrels, of which 20% were new and it comes in at 13.8% alcohol by volume, it is well crafted with wonderful overall harmony, focus, vigor and deft balance with juicy acidity and firm, but polish tannins. The new Trout Gulch release reminds me of Penner-Ash or Beaux Freres in some ways, it has an Oregon way about it, though it certainly shows it’s own sense of place and site, this is unique stuff. The mouth feel is lush and there is a ray of black, blue and red fruits, earthy tones, spice and nice sweet toasty wood notes. 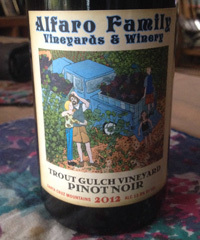 The 2012 Alfaro Trout Gulch Pinot starts with a mix of floral and smoky elements with dense black raspberry, blueberry, liqueur dipped cherry, wild strawberry and plum fruits with a Burgundy like earthy, leafy/tea, and loamy background along with saline, cedar and anise. A lingering finish with violets, cola/mocha and cherry aftertaste, look for a good drinking window on this delicious Pinot, but best from 2014 to 2018, all these Alfaro Pinots are stunning in the 2012 vintage, look for them! 2013 Schlossgut Diel, Riesling, Nahesteiner Trocken, Nahe Germany. Schlossgut Diel makes some of the finest examples of dry Riesling in the world and have been a long time leader in promoting their Trocken in the USA, and now with Caroline Diel leading this Nahe estate there is a lot to enjoy now, and there is a great future head, her winemaking is all about subtle elegance, grace and restraint. 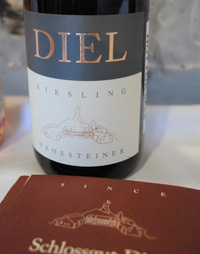 Diel makes a fine Pinot Noir, a super Rose and even though their dry wines are perfection, you should not overlook their beautiful Kabinett and Spatlese Rieslings, everything Caroline makes is gorgeous and timeless. I adore these wines and the 2013 vintage is looking wonderful for this world class estate, especially the superb and delicious 2013 Nahesteiner Trocken, due to be released in the US this fall. It was a great pleasure to see and taste with Caroline Diel in San Francisco at the Terry Theise trade tasting, I hadn’t seen her in many years, she’s been very busy with three young kids and an estate to run, her wines are pure class and unique, highlighting her talents, deft touch and the terroir of each site. Her wines are shy and austere when young, they are graceful and age beautifully, I am certain the 2013 Nahesteiner will only get better over the next 3 to 5 years, and it is lovely now, trust me. This dry Riesling starts with earth, spice and citrusy notes with white flowers, mint tea, sea brine and chalky stony essence leading to a brisk and energy filled palate with green apple, grapefruit and loads of lime fruits with hints of flint, hay, wild herbs, tangy apricot and mango. This is vivid, clear and zest Riesling that while zingy has good depth and density underneath. This would be a very interesting wine to cellar, though I really love it now, drink from 2015-2020.